Valencia CF: Valencia CF agree deal for Eder Balanta! Valencia CF agree deal for Eder Balanta! 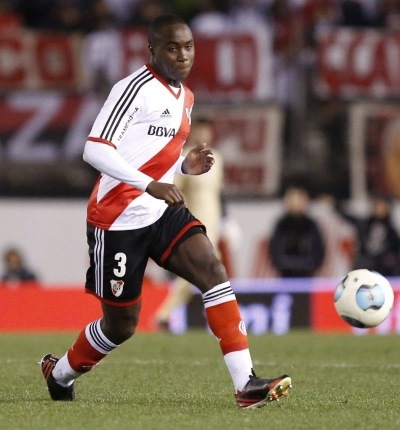 Valencia CF have agreed a deal with Argentine club River Plate for 21 year old Colombia defender Eder Balanta. The deal is reportedly in the range of 6.5 million euros. However, an issue must be addressed before the signing is complete. Valencia CF have four players with non EU passports: Otamendi, Jonas, Araujo, and Rodrigo de Paul. A slot must be cleared to make room for Balanta. Rodrigo de Paul will get an Italian passport before the start of the new season but a slot needs to be free now. Therefore, expect either Jonas or Araujo to be on their way out in the coming days. What do you think of Eder Balanta? Good signing or not? Is he capable of starting or do we need someone else?